Quechua culture is rich and vibrant with roots that extend well beyond the rise of the Inca Empire. The Quechua language, and its culture, is incredibly diverse and wide-spread across South America, with approximately forty-six different sub-languages and twelve million native speakers. In Peru, nearly a quarter of the population speaks Quechua, many of whom are concentrated in the mountainous regions of the Andean highlands. Quechua culture is believed to have originated at least a thousand years before the rise of the Inca Empire in the early 15th century. In fact, Quechua became the official language of the Empire, until the arrival of the Spanish conquerors in the mid-16th century. The Spanish colonizers drastically altered the Quechua way of life, banning the Quechua language and culture from politics and education. Despite these obstacles, the Quechuan’s unique heritage continues to flourish with ancient folk traditions, innovative farming techniques, rich textile crafts and complex weaving techniques. The Peruvian Quechuan’s are a largely remote people, living in the highlands of the Andes, with an efficient and sustainable use of limited resources. 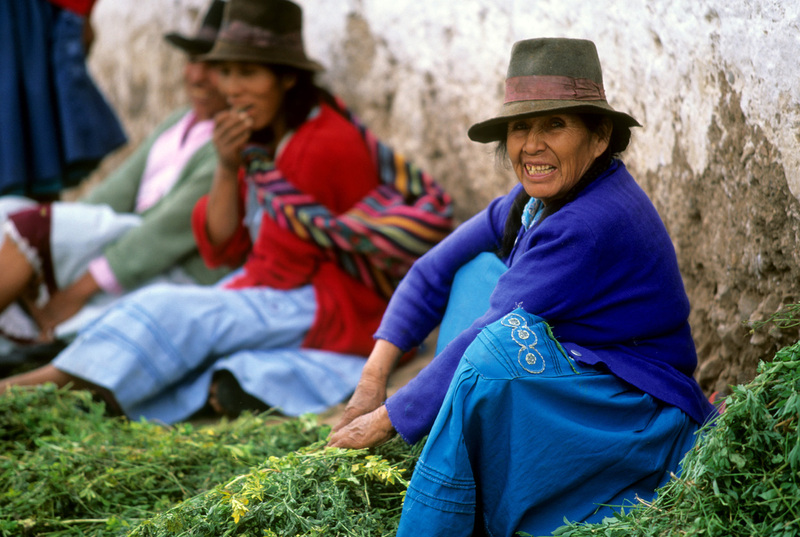 Quechua culture is centered upon community and mutual help (“ayni”). Their social system is based on the principle of reciprocity: helping a neighbor to be helped in return. Marriages are even subject to the approval of the whole community. After marriage, a couple will live with the husband’s parents, which is a testament to how important family is to the Quechua community. Farming is an integral part of life, from harvesting food to raising alpacas. 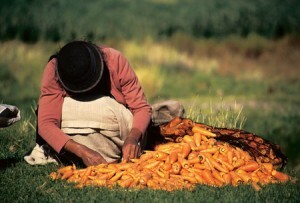 Quechua’s have pioneered farming techniques to adapt to the ecological demands of the varied Andean landscape, a steep continuum of high plains, harsh mountain slopes and warm valleys. They developed a sophisticated irrigation system that traverses the steep terrain, providing water for their fields. Potatoes, the staple food of the Quechua, prosper in the harsh environment of the altiplano and they have astonishingly developed over one hundred different varieties of the vegetable. Textiles, weaving and fabric are also an integral part of Quechua life, drawing from ancient techniques that have been passed down for generations. Quechua women can even be seen preparing wool for their looms when walking around the streets. Their handwoven shawls are highly functional-from providing warmth to transporting firewood and maize. Woven in an intoxicating mix of deep oranges, vibrant reds and pinks, their textiles honor Pachamama (Quechua for “Mother Earth”). They express their appreciation for growth and the natural world through their ritualistic weaving. Peruvian Connection has partnered with a textile cooperative to ensure the survival of these ancient Quechua weaving traditions. We offer a limited selection of authentic pieces handwoven by Quechua artisans, which are made with natural vegetal dyes and Peruvian wool: see our Handwoven Colla Bag, Pisac Bag, Cuzco Hippie Bag, and Tampico Belt. These remarkable treasures are steeped in history, tradition and culture.